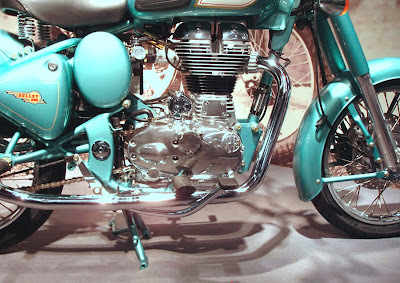 Royal Enfield repeatedly chose more expensive design features for its new Bullet Classic 500. (No, the kick starter was not left off to shave pennies.) The design process was described by Kevin Mahoney of Classic Motorworks, the U.S. importer, who was among the importers consulted by Royal Enfield. "Lack of kickstarter: This has received a lot of comments. The lack of one has nothing do to with cost as one might suspect. In reality it is the engineers at Royal Enfield saying 'we did such a good job on this starting system it doesn't need one.' There are quite a few (unit-construction engine, or UCE) bikes on the road now in Europe and so far no starting system failures. My ever-roving eye wonders if the Indian-market 350cc engine will have a kickstart. If it does I would guess that there may be a kit that could be developed for those who feel insecure without one." The UCE engine itself was an elegant but expensive solution to meeting standards, Mahoney said: "The reasons for the increased power and 'green' running engine is due in larger part to the unit construction. Some say they went that way to reduce costs, but in reality the opposite is true. The new engine is significantly more costly to produce. A lot of details such as reduced friction in the primary system, gear box, roller cams, hydraulic lifter and a wedge type combustion chamber all contribute to lower emissions and increased power." Royal Enfield also went to the expense of keeping the classic look for the improved and longer swing arm rear suspension. A square swing arm was suggested by developers, but importers felt it detracted from the vintage look. Importers also didn't like the original suggestion that the bike have a 1970's look. The factory went back to the drawing board to come up with the more retro styling finally unveiled in Cologne, Germany on Oct. 7. No expense was spared designing new parts either. The new bike has 300 new parts. While Enfield kept the bike close to its roots in specification (500cc pushrod, two-valve, long-stroke engine) and appearance, "the look of interchangeability is deceptive," Mahoney said. The forks have more rake, for better handling, and fenders are curved to fit the new 18-inch wheels (chosen, again, for better handling). The tank has a fuel pump inside it for the fuel-injection system and therefore needs a roll-over shut-off sensor. Who would have thought designing an "old looking" motorcycle would require so many modern complications? I suppose, when you stop relying on gravity to supply the fuel to the engine, you are suddenly in NASA territory. Mahoney emphasized that Royal Enfield wanted a more modern machine with the built-in reliability that could only come from a design on "a clean sheet of paper." But the company was determined not to abandon its "DNA." That means its single-cylinder "thumper" engine and the swing-arm rear suspension that made the original Bullet famous. So the Million Dollar Question is just that, what will the MSRP be set at? This article seems like a justification for a shockingly higher price point, maybe $7k. MSRP is already near $6,000 without the new features. It sure isn't going to go lower. It's a niche product. Honda and Suzuki will offer motorcycles for less that go faster no matter what. They can make money on volumne alone. Maybe I'm biased because I am in Florida and can ride all year because, but to me, all motorcycles seem cheap -- because I am comparing them to cars. So you can't go by me.